However it is always not possible to have colocated teams. 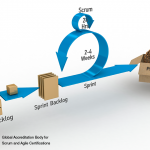 At times the Scrum teams may be distributed due to outsourcing, offshoring, different physical locations, work from home options, etc. In case of distributed teams, appropriate infrastructure has to be made available to ensure that regular communication takes place among team members. Whenever possible, a distributed team should have an in-person Project Kick-off Meeting at a common location. This will help establish the basis for future communications. It is also a best practice to have different team members relocate to another site to act as cultural liaisons to ensure proper communication throughout the project. Colocated Teams (i.e., teams working in the same office) – If teams are colocated, preferred modes of communication include face to face interactions, decision rooms or war rooms, Scrumboards, wall displays, shared tables, and so on. Distributed Teams (i.e. teams working in different physical locations) –Some tools that could be used for effective collaboration with distributed teams include video conferencing, instant messaging , chats, social media, shared screens, and software tools which simulate the functionality of Scrumboards, wall displays and so on. Because in person Daily Stand-up Meetings are not possible in case distributed teams, they need to be done electronically. One important point to consider here is to fix an acceptable time for everybody for the daily meeting – for example, early morning for America, mid-day for Europe, and evening for Asia Pacific and so on. 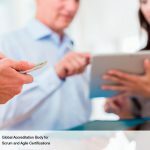 For more information on Scrum, Scrum Body of Knowledge (SBOKTM Guide) from SCRUMstudy is a recommended reading.